Id love to give this a perfect review but the droves of people with their dogs and kids on any given sunny nice day prevent me from pressing that five-star button. Also the wee little road (paved, thankfully) that connects the park to the main highway is narrow and can be really busy on a nice day. If youre Vin Diesel and/or engaged in racing similarly-classed small imported Japanese cars with absurd spoilers and exhausts that scream considering-MBA-when-I-graduate-high-school, I would suggest a different location to do so. Youre gonna end up power sliding off the road into a pumpkin patch. Expansive, well-kept oceanside walk with piled driftwood skirting paved trail. Great for dogs, kids, elderly, disabled. Excellent sweeping sky views and loads of beach to share especially when the tide is out. Grassy area with picnic tables and some covered shelter-kite flying on a windy day! Public washrooms relatively well maintained. Ample parking lot. Basic, small camping area fenced- in ...takes about fifty tenters, open May long weekend to September. Well maintained. Excellent picnic and walk at a clean beach fifteen minutes to Sydney or fifteen minutes to Victoria in good traffic. Nice little spot to camp. You cant ask for a better view. The RV sites are nearly on the beach and the tent sites are shaded by fruit trees. A couple of minor drawbacks: The beach is rough and rocky and you cant have a fire at your campsite. There is a communal fire pit. Overall a decent place to spend a night or two on the peninsula. About a 20 minute drive from the centre of Victoria is a comfortable, easy walk along the ocean with a nice view of the islands. There are a lot of dogs off leash which is fun to watch, but because of that its not a good place to bring a dog thats not friendly with other dogs, even on a leash. A little diamond in the rough. The camping is great, right off the beach in nice grass and protected by wind from the trees. The beach is miles long and great for letting pets run free. The bathrooms are just port-a-johns and no electric, which is OK by us. Such a calm and peaceful spot. Theres a nice trail for walking, or you can walk on the beach. The sand is quite soft, but its mostly rocky and there is a lot of driftwood, but there are a few Sandy spots where you can find them. Nice beach, clean park, lots of places to walk and good free parking. The under cover picnic area is well maintained. There are also washrooms on site. Overall a fantastic beach and a great place to spend a sunny afternoon. Island View Beach is a popular local spot. Dogs welcome. Large enough for a good hike. Excellent views across the Straits of Juan de Luca to the Islands. Plenty of bird life and even fossil hunting. Great beach to do a quick getaway from the "busy" downtown! Great beach to walk along with dogs and friends. Keep your eyes on the tide, and look out for jellyfish... That ocean is alive! Beautiful, amazing beach! A lovely trail to walk, and the view is truly splendid! Only downside is that there are dog restrictions June to September, but even then theyre still allowed. Beautiful dog friendly (off leash) beach park. You can walk along the beach for miles. No bicycles allowed which is great. Clean public washrooms, family picnic areas, plenty of parking. Very pleasant walking path accessible from the lot. Nice view of the ocean. Some broken pavement. Park itself is worth a good walk. Great views of the water and some ocean birds. Great beach with plenty of space so never crowded. The view is fantastic. At the right time of year someone can pick apples, plums and cherries in the campground near by. A nice beach a bit out of the way, good place for kids and close to the bike trails so its a good destination. No bike racks though, so you have to use a fence. Its a beach that a lot of people forget about. Its easy to get to. On my last visit, it was really storm and quite a sight for storm watchers. Beautiful beach, just have to be comfortable with off leash dogs. Volunteer cleanup taking place today, big thanks to the volunteers! Lovely beach with a nice view of Mt Baker. Good size and a gentle slope on the sand. Lots of beach at low tide. Little crabs too. Great beach to take a walk with my dog. When the tide is up I can walk along the beach side path. Ample parking and restrooms. Offers nice flat walks of various length along the beach with a view of the coast. Public restrooms and free camping available. Something for everyone. Walk the beach or head the trail to lessen the wind. Dogs and kids galore and lots of birdwatching. You wouldnt know it was here. Good campsite right on the ocean for those passing through or want to be close to the city. Beautiful inside passage beach with amazing views. Great place for a walk or paddle board. Shaw Go WiFi available. Rocky Beach that when I went was fairly quiet. Also has outhouse facilities and a small covered pavilion too. We arrived here just by coincidence and we really enjoy the visit. Go and take some nice pictures !!!! Very pretty beach. Lots of room to park. Only one covered picnic area. Sandy Beach with drift wood. Beautiful place. Lots of room on the beach to explore, splash in tidal pools and play in the sand. Excellent beach for walking and wildlife. 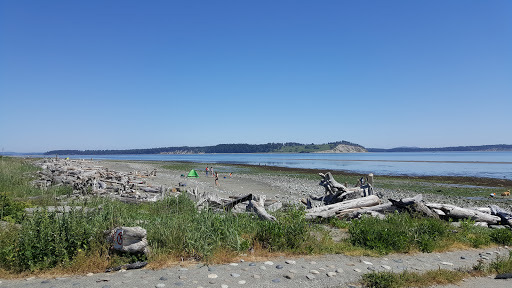 Sandy beach, boat launch and camping. Even has WiFi. Island View beach has some nice sandy beaches, and covered eating area, I like this beach. Another fine parking lot, it even has a lovely regional beach park attached to it. Long beach walks on low tide. Area for picnicking. Bathroom provided. Nice view. Nice trails for a hike.. No hills an easy walk...millions of BEAUTIFUL Roses..
Great place to walk your dog by a beach off leash with plenty of parking. Nice beach, some trails. A little busy, but good spot for a walk. Wonderful place to walk. Long open beaches. Quiet. Nice view. Stunning! Refreshing! Great place to take the whole family. This is my favorite beach and view. Great place to camp. Best place for ocean walk with the dog on the peninsula! Love walking my dog here - hoping they dont change that! On a good day you can see Mount Baker clearly.